Give the Gift of Track! 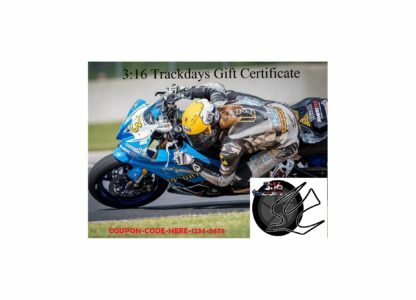 The 3:16 Trackdays Gift Card makes the perfect gift for your Motorcycle Track day or Motorcycle Racing Enthusiast. It can be used at any of our events and will never expire. *Note* All participants of events must adhere to minimum requirements, terms, conditions, and rules. After you purchase please allow 2-3 days to receive your Gift Card which will arrive as a PDF File to your e-mail address.